Extensive kill list includes over 75 bacteria, viruses and fungi. Non-acidic formula won't harm sealed stone, sealed grout or glazed tile, making it ideal for all washable, hard, non-porous surfaces. High 1:64 dilution ratios make this antibacterial cleaning concentrate a cost-effective solution for use in virtually any professional facility. Proven effective against HIV, MRSA, staph, E.coli, cold, flu, athlete's foot fungus and more. 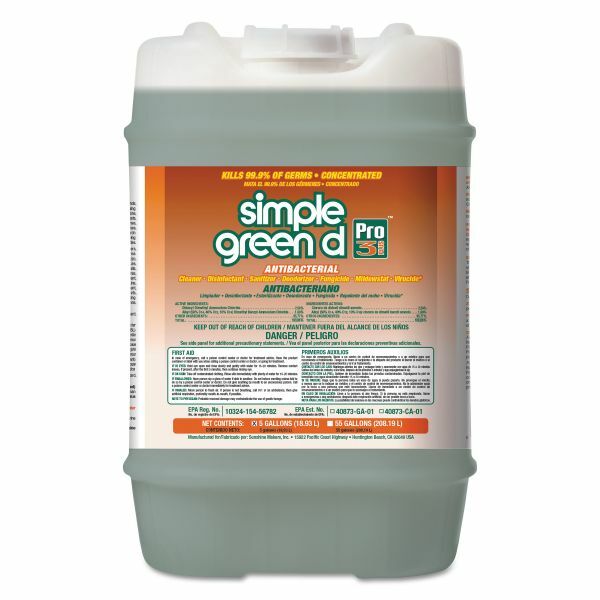 Simple Green d Pro 3 Plus Antibacterial Concentrate, Herbal, 5 gal Pail - Simple Green d Pro 3 Plus is a hospital-grade antibacterial cleaner that features an extensive kill list of over 75 different bacteria, viruses and fungi, including antibiotic-resistant superbugs. Provides protection against a wide variety of highly contagious and potentially deadly pathogens. The broad-spectrum, bloodborne pathogen compliant formula is proven effective against HIV, MRSA, staph, E. coli, cold, flu, athlete's foot fungus and more. The non-acidic formula won't harm sealed stone, sealed grout or glazed tile, making it ideal for all washable, hard, non-porous surfaces. High 1:64 dilution ratios make this antibacterial cleaning concentrate a cost-effective solution for use in virtually any professional facility. Kills serious health concerns including Staph, Pseudomonas and Listeria. High level of active ingredients to ensure performance. Controls and inhibits mold, mildew and fungi growth.